This is a souvenir for the partier in your family or circle of friends! The Appalachian Trail is all about shedding stress and getting out and enjoying yourself in nature. 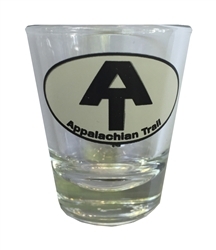 Unfortunately, sometimes life is too busy for that, but you can always unwind a bit with the help of your Appalachian Trail shot glass! If you are more of a beer drinker, or are not a drinker at all, check out our Mountain Crossings pint glass. It is great for ice cold beer or your favorite thirst quenching drink!